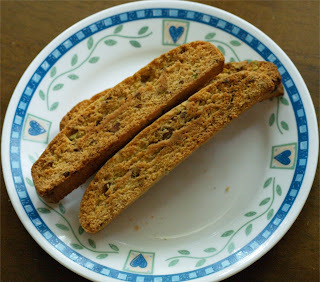 A few months ago, I posted this recipe for almond biscotti and this one for chocolate biscotti. While I was on that biscotti kick, stumbled across this one for one made with pistachios. I knew I had to attempt this one at some point so I printed it out and added it to my pile of recipes to try. Did you know that eating one to two handful of pistachios daily help lower your LDL (bad cholesterol)? Uh-huh.. it was proved by Penn State researchers, read about it here. I have had *cough* two pieces today and it is so good. Position rack in center of the oven. Whisk eggs, sugar, butter, oil vanilla and almond extracts and lemon peel in a large bowl. Form dough into a 15 x 4 – ½ inch log prepared sheet. Bake 30 minutes until edges are lightly browned and toothpick inserted comes out clean. Lay slices flat on cookies sheet and bake until bottom of cookies turn golden about 10-12 minutes. Turn biscotti over and bake 10-12 minutes more. Cool biscotti on wire racks. Note: If you can’t find pistachio, you can substitute almonds. * I did not add the lemon rind and they still taste wonderful.